Mike suggested a 2 day trip to southeast Alberta to link up with some friends; unfortunately, Ray and Phil couldn't make it. I had a Saturday evening commitment so we couldn’t do the smart thing and leave Saturday night and stay in Medicine Hat. Mike invited Hank Vanderpol along and the three of us left Calgary at 2 am on Sunday. The skies were clear in Calgary but we soon encountered fog and snow making for a slow drive for the first couple of hours. We reached our destination just as the sun was rising and met up with Milt Spitzer and Yousif Attia. We did a tour of the area ranging as far as Pakowki Lake to the west, Wild Horse to the south, and Cypress Hills to the northeast. 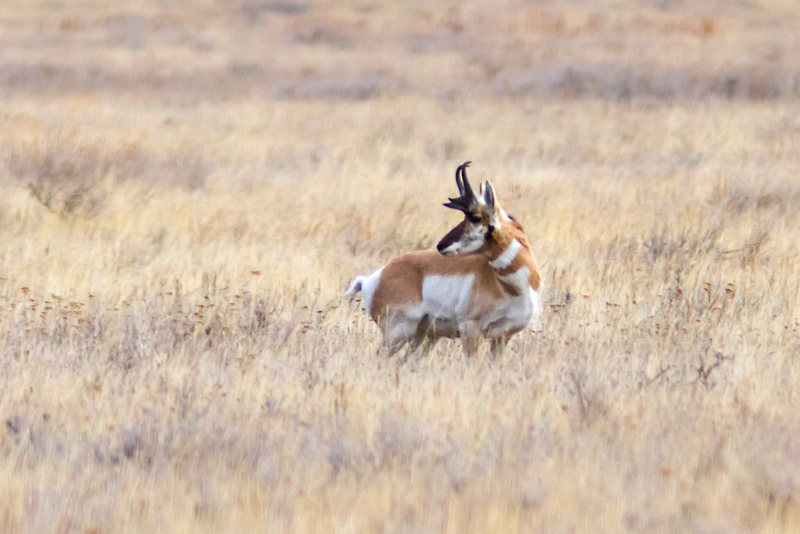 It was still a bit early for migrants and returning summer residents but we did see some new team birds including Lapland Longspur, Ferruginous Hawk and Western Meadowlark in addition to one new mammal – Pronghorn Antelope. Throughout the area, there was a good selection of birds of prey. We came across a Great Horned Owl on a nest and a Snowy Owl hunting in a country cemetery. 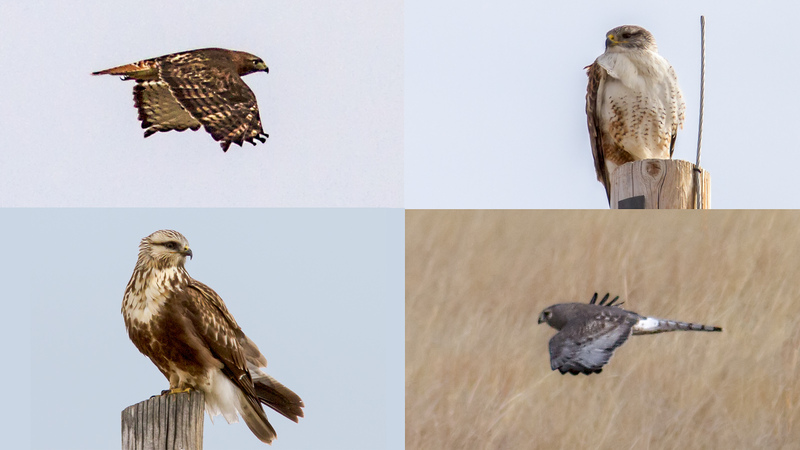 On our drive, we saw many Ferruginous Hawks and Rough-legged Hawks along with a few Northern Harriers, a couple of Red-tailed Hawks and both Bald and Golden Eagles. Pakowki Lake was surprisingly almost ice-free but had very few waterfowl. Ducks included Mallard, Northern Pintail, Redhead, Common Goldeneye, Green-winged Teal and a single scaup. We didn’t do too much birding in the Cypress Hills but did enjoy seeing a number of male Mountain Bluebirds while driving along the Wildcat Trail. 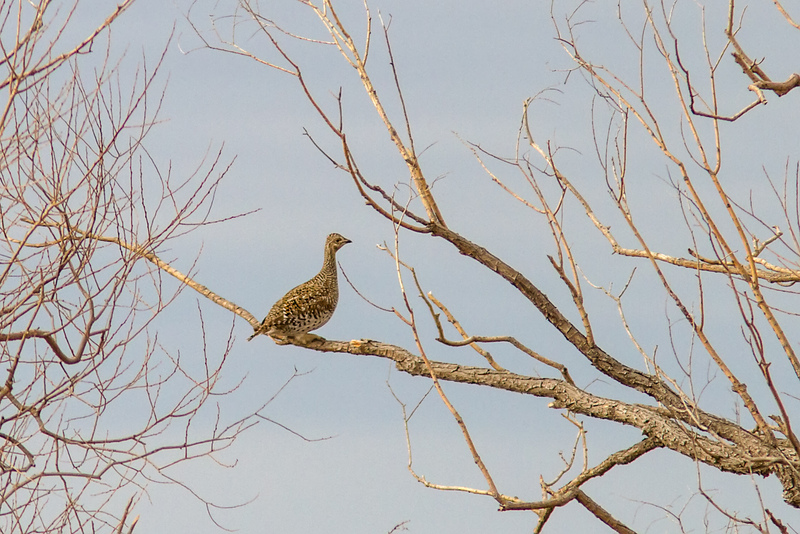 Near the U.S. border, a highlight was ~10 Sharp-tailed Grouse perched in trees. We had planned to stay with Milt Sunday night and were looking forward to a good meal and a relaxing evening. We would then bird our way back to Calgary the next morning. Those plans changed in a hurry once we saw an updated weather forecast – Blizzard warnings for Medicine Hat and Brooks starting that evening and extending through the next morning. After a brief rest and a quick meal, we hit the road for the 3 hour drive back to Calgary. We encountered periods of rain and snow but, fortunately, were able to outrun the storm. We arrived back in Calgary at 9:30 pm … only 19 ½ hours after we had left. With 4 new birds and 1 mammal, our team totals our now 135 birds and 15 mammals making 150 overall – 30% of the way! Note: by request, my original post has been edited to remove mention of a particular species which has a low population in Canada (but healthy populations to the south). Scientists involved in reintroduction efforts would prefer that birders and photographers stay away from the birds until the population is more robust. A visit to "Wine Country"